Mubarak And Sons Sentenced (Again) To 3 Years For Corruption : The Two-Way It was the second court to give the same sentence after the earlier conviction was overturned. The latest ruling can be also be appealed, Mubarak's attorney says. 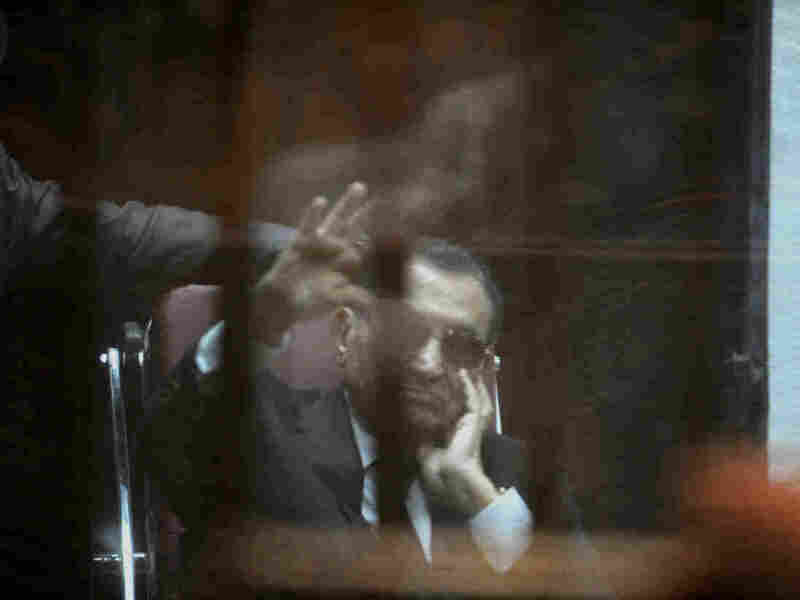 Ousted Egyptian president Hosni Mubarak sits in the defendant's cage during his verdict hearing in a retrial for embezzlement on Saturday in the capital Cairo. The Egyptian court sentenced Mubarak and his two sons to three years in prison. Ousted Egyptian leader Hosni Mubarak and his two sons were sentenced to three years in prison today in a retrial of the corruption case brought against them in the wake of the 2011 "Arab Spring" uprising that deposed the long-time ruler. "The ruling of the court is three years in prison without parole for Mohamed Hosni Mubarak and Gamal Mohamed Hosni Mubarak and Alaa Mohamed Hosni Mubarak," Judge Hassan Hassanein announced on Saturday, according to Reuters. It is the latest in a long and winding judicial road for Mubarak. Last year, an Egyptian court overturned Mubarak's murder conviction stemming from his alleged order to kill hundreds of anti-government protesters in the run-up to his ouster. The case decided on Saturday refers to the "presidential palaces" affair and relates to charges that Mubarak and his sons embezzled millions in state funds over the period of the leader's 30-year rule. "Last May, Mubarak was sentenced to three years in prison on charges of diverting public funds earmarked to renovate presidential palaces and using the money to upgrade family properties. His two sons were given four-year jail terms in the same case. "In January, Egypt's high court overturned the convictions, and the case went back to court for retrial." According to The Associated Press, the verdict includes a $16.3 million fine to be paid by the three men and calls for the return of the $2.7 million they embezzled. A lawyer for Mubarak says the judge's decision can be appealed, according to AP.